We are not fans of M.2 SATA based devices and yet the MX500 M.2 variant is the exception that proves the rule. This drive is perfectly suited for numerous builds and the fact that you can actually get it slightly cheaper than the 2.5-inch version makes it a veritable no-brainer. Crucial drives are a great option for strong performance from a brand that is well known and gives a great long-term warranty. For a bit more money you get a better warranty and a very capable drive, it's one of if not the best SATA drives on the market. The Crucial MX500 1TB SSD with Micron's 3D NAND flash memory is the fastest SATA SSD we've ever tested, reaching performance levels above the outgoing Crucial MX300 750GB SSD in virtually every category. The fact that the the MX500 1TB matches the 860 Pro 1TB's performance for a little over half its price highlights how strong of a contender the Crucial [MX500] is. 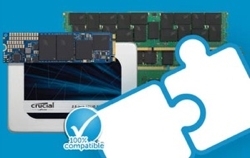 The MX500 1TB is the best overall value in the SATA SSD market. Crucial priced the drive aggressively … and we can't think of a better value even if we factor in NVMe SSDs. Crucial has knocked another one out of the park with its new MX500 SSD. There are some hallmarks of excellence that make something worth buying: performance, quality, and price. I’m not going to wax poetic here, the MX500 has all of these things. Crucial has created a fantastic product with the MX500 SSDs. This model proves beyond a shadow of a doubt that Crucial is quickly learning how to refine their new 3D TLC NAND technology and fine-tune SMI controllers so as to take full advantage of its unique abilities. Even though buyers should not expect NVMe performance levels the MX500 does indeed set the new gold standard upon which all SATA based SSD’s need to be judged – and not just TLC drives. Aside from the MX500’s attractive price and performance, it also comes with a 5-year limited warranty, AES 256-bit hardware-based encryption, integrated power loss immunity, adaptive thermal protection, data defense against data corruption, dynamic write acceleration, and you also get a free Acronis True Image HD software. The Verdict - Opinion. The Crucial MX500 1TB SSD delivers consistent performance and is a welcome improvement to the MX series. The MX500 offers excellent performance for the price, and it will likely become one of our more recommended SSDs in the coming months. Crucial's MX series has been known for delivering solid performance at a budget price while checking off all the features boxes one can think of. This time around, it is no exception. "I'd recommend considering the Crucial P1 for consistent performance on a budget..."
...they have found a happy medium mixing...QLC NAND storage with SLC storage on the same NAND chips. Crucial P1 1TB NVMe SSD is a drive which should satisfy all gamers and users who are looking for something faster than a standard SATA SSD. Crucial's P1 SSD is a great choice for the consumer looking for an easy and affordable way to boost the performance and storage capacity of their desktop or notebook computer. There’s one word to describe this Crucial’s P1 NVMe PCIe SSD and that’s “fast”. Crucial has always been known for releasing good performing solid state drives at very competitive prices so it is no surprise their first consumer NVMe drive is one such drive. …Crucial has created a series that simply sets a new standard of value in the NVMe marketplace. Crucial's P1 1TB is a great budget NVMe drive that offers fantastic performance at an affordable price. Overall I really like the Crucial P1, performance was a surprise...If you are looking to make the jump to NVMe be sure to give the Crucial P1 a look. 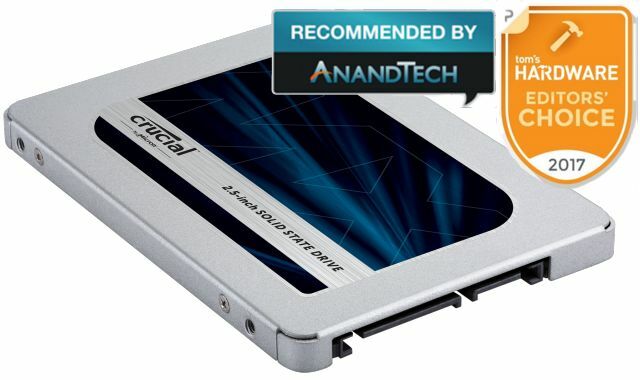 Crucial's BX500 480GB is a great budget SSD drive that offers good performance at an affordable price. Ballistix Sport AT DDR4-3000 memory is an interesting option for all gamers who care about high performance at a reasonable price but still want perfect stability for long gaming sessions. 90 out 100 While certainly not an optimal choice for every scenario or every build the new Ballistix Sport AT series proves that you can create a new series of RAM that has been customized for specific motherboards and yet still be a good choice for a wide range of ‘boards and builds. The performance was great for a 3000MHz kit, it often beat most of our 3200MHz kits and was nipping on the heels of the 3466MHz kits in our past lineup. Great job Ballistix! In conclusion, the Ballistix Sport AT DDR4 3000Mhz 32GB (4x8GB) memory kit sports an attractive design which I really like and offers good performance with a good build quality. The overclocking performance of this kit was beyond anything I expected. I’m used to getting 200-300 MHz tops from a kit. Build quality was top-notch, as expected from the company, and the aesthetics and design of the Tactical Tracer’s heat spreader is great. These are a new series of high-performance memory designed for modern DDR4 systems. Overall, I believe the Ballistix Tactical Tracer DDR4 2666Mhz 32GB (4x8GB) memory kit deserves our recommended award. Congratulations Ballistix for creating what is easily the best designed RGB LED enabled RAM series released to date. Ballistix has done it again with the Ballistix Tactical Tracer [RGB]. Overclocking it, on the other hand, has notable improvements. Just the small jump from 3466Mhz to 3600Mhz without touching any other settings places it in 1 st place across the board in our testing... Great job Ballistix! Even though Ballistix Sport LT doesn’t look like top overclocking memory, it has really high overclocking potential and offers high performance even at default settings.